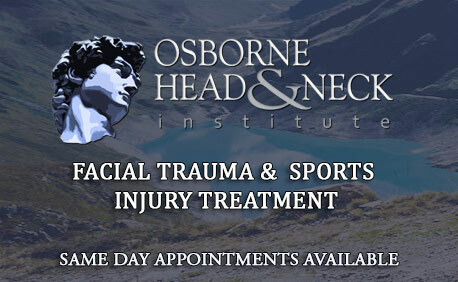 The Osborne Head and Neck Institute is a world-renowned leader in the diagnosis and treatment of cranio-nasal-facial trauma and sports injury. Members of our team have treated and served as team consultants for the LA Lakers, LA Dodgers, LA Kings, USC football team and many more local professional and amateur athletes. We are experts in the management of facial trauma including nasal fractures (the broken nose), orbital blowout fractures, mandible fractures (jaw fractures), zygoma fractures (cheek fractures), sinus fractures, ear injury, lacerations and scar revisions. In addition to facial trauma and sport related injuries we specialize in all aspects of facial and reconstructive surgery within the head and neck region and perform acute and revision reconstructive surgery on all facial and nasal trauma. Our expert team thanks you for visiting the Osborne Head and Neck Institute trauma website and we look forward to seeing you soon.